1.1 When Canning is Just too Much: Dehydrate! 1.5 Three Solar Food Dehydrators - solar energy at work! 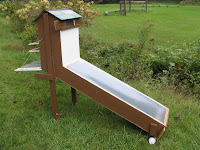 1.7 homemade solar food dehydrator "turbo-powered"
When Canning is Just too Much: Dehydrate! With information about different ways of dehydrating food, dehydrator plans and uses for dried food. By Grow Appalachia. homemade solar food dehydrator "turbo-powered"
By the Little Colorado River Plateau Resource Conservation and Development Area, Inc.
With detailed information about the basic science aspects to consider in the design. By Brainz. Here is an introduction to our Solar Dehydrator project. The plans to build can be found at the google docs link below. The URL listed in the video is dead. (information about solar hot air collectors and solar chimneys, which can be parts of solar dehydrators, and some sun-collecting and air flows science).